DENSOLID®-HK7 is a rapidly curing, mechanically hard-wearing coating based on polyurethane. DENSOLID®-HK7 is characterised by its high abrasion resistance and impact strength. Thanks to these properties, DENSOLID®-HK7 is an ideal protective encasement in the welding seam area on plastic pipes that have protective wrappings. 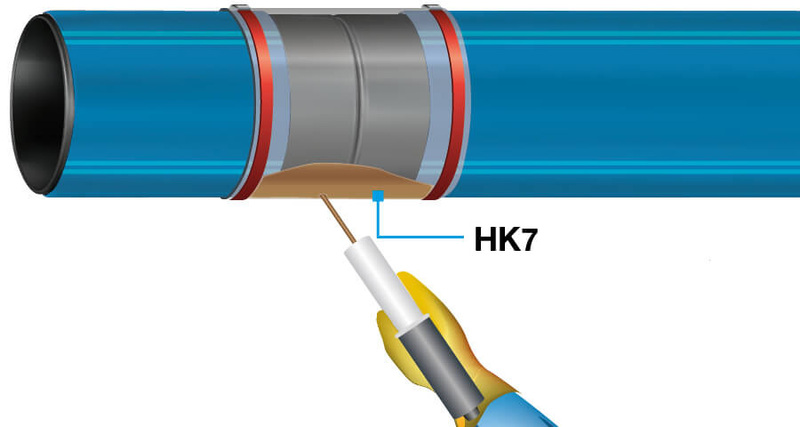 DENSOLID®-HK7 is ideal for coating welding seams on wrapped plastic pipes and pipelines that are installed using the horizontal directional drilling (HDD) or (rocket) pipe-plough method (trenchless installation). This solution has been proven as exceptionally effective in construction projects across the world, with its balanced property profile and easy application from a two-chamber cartridge, combined with a special casing system.